Prior to 1500 AD, this collective group traveled from their original home in the Southeast, down the Ohio River to its mouth (Dorsey, 1886, p. 218). when they arrived at the Mississippi River the group was separated when trying to cross. Those that traveled upriver were known as U-Mon-Hon meaning “against the current” or “upstream.” the U-Mon-Hon or Omaha was also comprised of the Ponca, Osage and Kansas. The group that traveled down river earned the name u-ga-xpa or Quapaw, meaning “with the current” or “downstream.” The Quapaw continued south along the east bank of the Mississippi River into what is now Arkansas, and these descriptive names were already in place by the time Hernando de Soto met the Quapaw Tribe when he crossed the Mississippi River in 1541 (Fletcher & Laflesche, 1911, p. 36) and (Baird, 1989, p. 14). Later during the 1600s, the Ponca, Omaha, Osage and Kansas that went upriver along the Mississippi, stayed for a time near present day Osage and Gasconde Counties in Missouri, west of present day St. Louis. At this time they were joined by the Iowa, who belong to the Chiwere dialect of the Siouan language group, similar to the Otoe and Missouri Tribes. It is then believed that the Omaha, Ponca and Iowa proceeded slowly northward through present day Missouri, and into present day Iowa. They migrated up the Des Moines River to its headwaters in what is now Minnesota and built a village for a time near the pipestone quarries. Historical and archaeological evidence verifies that the Omaha, Ponca and Iowa as a group, then traveled west to build a fortified village on the Big Sioux River, north of Sioux Falls, South Dakota (Howard, 1965, p. 15). The Rev. James O. Dorsey, for many years a missionary and amateur ethnographer among the Ponca and the Omaha in the late 19th Century, states that later the neighboring Yankton Dakota Tribe made war on the Omaha, Ponca and Iowa while they camped on the Big Sioux River, which forced the group to travel west to the present day site of Lake Andes, in Choteau County, South Dakota. It is believed that it was here, prior to 1673, that the Omaha’s sacred cedar pole was cut, an important religious object, and afterward the Omaha assigned each clan and sub-clan its particular customs and duties (Dorsey, 1884, pp. 211-213). both Omaha and Ponca legends say they were living in a village near a lake when the sacred cedar pole was found. It was in this same area that Omaha and Ponca oral history say that the Omaha, Ponca and Iowa first encountered the Marinara, who at that time occupied territory in Northeastern Nebraska. At first they warred with the Marinara, but later a peace was determined by performing the wa-wan or calumet ceremony. Then a grand council was established to reach an agreement on the terms of the peace, and rules of war and hunting. (Fletcher & Laflesche, 1911, p. 218). It is also believed that it was at this time that the Arikara showed the Omaha, Ponca, Iowa group how to build an earthlodge, and in return, the Omaha gave the Marinara permission to perform certain aspects of the Hethuska Society traditions and dances (Howard, 1965, p. 14) (Duncan, 1997, p. 33). In the early 1700s, the Omaha, Ponca and Iowa migrated up the Missouri River to the mouth of the White River in South Dakota. In his work titled Known Village Sites of the Ponca, Dr. James H. Howard cites evidence that the Ponca continued westward to the Black Hills, while the Omaha and Iowa remained in the vicinity of the White River around 1715 (Howard, 1970, p. 131). Later it is believed, the Ponca returned to build a village with the Omaha and the Iowa at the mouth of the White River. Then the Ponca migrated by themselves, downstream along the Missouri River, then pushed westward and settled in Nebraska near the Niobrara River. According to Dorsey (1884, pp. 211-213) and Howard (1965, p. 11), the Ponca built a fortified village by themselves by Ponca Creek near the Niobrara River when the group reached the vicinity of present day Niobrara, Nebraska, in what is now Knox County. This archaeological site known as “Ponca Fort,” has been dated to circa 1700, and closely resembles the middle Mississippian fortified towns found in Ohio which date to 800 through 1550. During this time, the Omaha and Iowa pushed further south along the Missouri River to build a village at Covington, Nebraska in present day Dakota County. Then, according to John John Champe (cited by Wood, 1959, p. 10), the Omaha and Iowa continued moving further south to build a village along Bow Creek near present day Wynot, Nebraska in Cedar County about 1735. However, attacks on the Omaha and Iowa villages by the Dakotas forced both the Omaha and the Iowa to leave the “bad village” site and migrate further south along the Missouri River. By 1770, the Omaha had migrated to a site on Omaha Creek to build a fortified earth lodge village by themselves which they called “Big Village” in present day Thurston County, Nebraska. The Iowa continued further south almost to the Platte River, making a village near present day Florence, Nebraska in Douglas County. From that time, the Iowa never again built a village near the Omaha (Fletcher & Laflesche, 1911, p. 86). Throughout the 1700s the Ponca were referenced in various maps and literature as living between Ponca Creek and the Niobrara River in North-central Nebraska. The Ponca made first contact with Spanish traders in 1789, and in 1790 their estimated population was approximately three thousand strong. (Duncan, 1997, p. 59) the Ponca then made first contact with French traders in 1794. Soon, the Ponca learned the value of being the middlemen in trade between Europeans and those tribes along the Upper Missouri, and in 1795 they began the practice of stopping and raiding trading craft as they went up the Missouri River (Howard, 1965, p. 25). By the time the Lewis and Clark expedition reached the Ponca village in September 1804, on the lower side of Ponca Creek, about two miles from the Missouri River, the Ponca had become quite familiar with Europeans. Unfortunately, this association with Europeans had caused a smallpox epidemic among the Ponca in 1800 prior to Lewis and Clark’s arrival, which significantly reduced their number (James, 1823, p. 225). During the war of 1812, the Ponca and the Omaha allied with the United States, while the Sauk, who held territories northeast of the Omaha, allied with the British. Involvement in this warfare continued to reduce the population of the Ponca. Formal relations between the Ponca and the United States did not begin however, until 1817. It was then that the first treaty was made between the Ponca and the U.S. to establish “perpetual peace and friendship” (Howard, 1965, p. 27). In the early 1800s, the Ponca were still a semi-sedentary tribe living in earth lodges that the Arikara taught them and the Omaha how to construct. They planted corn and other crops, hunted buffalo occasionally and traded for many of their goods. However, they were vulnerable from attack by larger nomadic tribes as evidenced by an event that took place in 1824. Peter Wilson, acting on behalf of Maj. Benjamin O’Fallon, visited a group of Ponca at the mouth of the Niobrara River. Upon arriving, he learned that a party of 30 Ponca men had been returning home from a friendly visit with the Oglala Lakota to the north, when they were attacked by a group of Brule or Sicangu Lakota. Of the 30 Ponca, only 12 returned alive. Among the 18 killed was the famous Ponca Chief, Shu-de-ga-xe or “Smoke Maker” (the first of this name) (Report of P. Wilson to B. O’Fallon, 1824, National Archives, St. Louis Superintendency). In 1825 another treaty with the Ponca was made, in which the Ponca acknowledged that they lived within the “territorial limits of the United States,” thereby recognizing the supremacy of the larger force of the U.S. Government. This treaty also stated that only “American Citizens” were to be allowed to reside among the tribe as traders, as was the custom at that time, and the tribe agreed to delegate the punishment of offenders to the United States Government, giving American traders an advantage over French and Spanish traders in the area. This was followed in 1826 by yet another treaty, in which the Federal Government agreed to receive the Ponca “…into their friendship and under their protection.” it should be noted, that there are no records that exist to date, showing that any member of the Ponca Tribe have ever killed white settlers or soldiers, or have ever taken up arms against the United States of America. A fact that still provides modern-day Ponca with a certain level of pride. Since the “War of 1812,” the Sauk Tribe had continued to make war on the Omaha and the Ponca earthlodge villages which lay between the Sauk Territory and the buffalo herds to the west. It was not until after the United States military subdued the Sauk in 1834 during the Black Hawk War, that the Ponca and the Omaha gained some relief. (O'shea & Ludwickson, 1992, pp. 36-39) by 1835, a cholera epidemic killed an estimated 10% of the Ponca Tribe's population, further reducing their number to approximately 700 persons (Howard, 1965, p. 24). During the 1830s the Ponca were generally thought to be allies with elements of the Yankton Dakota and the Teton Lakota and frequently joined with them in warfare against the Pawnee. This was believed to be a means of self-preservation for the now smaller tribe of Ponca, whose lands were in-between the Lakota and Pawnee territories. However, the larger tribe of Pawnee frequently made war on the Ponca when their northern allies were not around. Occasionally, small elements of the Lakota would sometimes raid the Ponca as well, taking horses or stealing corn they had grown. As time progressed, the Ponca and other semi-sedentary tribes along the Upper Missouri River, such as the Omaha, Arikara, Pawnee, Mandan and Hidatsa, who were attached to their earthlodge villages and cornfields, were no match for the nomadic Dakota and Lakota, who were very mobile, well-armed and always knew the exact strength and precise location of these tribes. In the summer of 1846, an advanced party of 400 Mormons were heading west to find a route through the Rocky Mountains after being driven from their homes in Nauvoo, Illinois earlier that year. Buffalo Bull – head chief (also known as Little Bear. Two Bulls – son of Buffalo Bull (he becomes head chief when his father dies in September 1846. Black Warrior – a chief of the 2nd rank (nephew of Buffalo Bull). Buffalo Chip – a chief of the 2nd rank (after Black Warrior dies in August 1846). Iron Whip – principle chief of Gray Blanket village (brother of two Bulls). White Eagle – son of Iron Whip (has hereditary leadership rites). Drum – principle chief of Fish Smell Village. Smoke Maker – a chief of the 2nd rank (son of the chief of the same name who was killed by the Sicangu Lakota in 1824. Little Chief – son of Smoke Maker (has hereditary leadership rites. Finding that the Pawnee had deserted the village, the nine Ponca chiefs invited the Mormons to spend the winter with them. The Mormons were given some provisions to tide them over and assigned a camp near the Gray Blanket village near the junction of the Niobrara and Missouri Rivers (Tibbitts, 2003, p. 4). There were many Mormons who wrote journals about their life and enjoyable experiences among the Ponca. The Ponca Chief Iron Whip indicated the best route for the Mormons to follow when they continued on their journey west in April of 1847. Later in 1847 the Mormons settled in the Rocky Mountains in what is now Salt Lake City, Utah. In the fall of 1855, according to an account recorded by Rev. James O. Dorsey, an unusual large scale conflict took place between the Ponca and their old enemies the Pawnee. It seems that both tribes were out on their tribal buffalo hunts and the encounter was accidental. The Ponca were divided into two hunting groups, those from the Gray Blanket village and those from the Fish Smell village. The hunters from the Fish Smell village were the first to see the Pawnee from a distance in their hunting camp, and charged to attack. However, by the time they entered the camp, the Pawnee had fled. The Fish Smell Poncas contented themselves with looting the deserted Pawnee hunting camp, taking such things as dried meat, moccasins, leggings, and rawhide lariats left behind. Meanwhile, the Ponca hunting party from the Gray Blanket village ran into the fleeing Pawnee and after an intense running fight, killed them to a man. To commemorate the victory over the Pawnee, Chief Smoke Maker's newborn son was carried to the battlefield by an old woman and caused him to put his feet on two of the Pawnee corpses, whereupon he was given the name Non-ba-a-ton meaning “treads on two” (Dorsey, 1890, pp. 377-383) (Fletcher & Laflesche, 1911, p. 54). The tribal buffalo hunt in 1855 was the last successful big hunt. Beginning in 1856, although the Ponca tried to hunt in the spring and the fall in the traditional way, they were frequently turned away by Teton Lakota war parties. Cut off from the buffalo and fearful of leaving their villages to farm outlying fields, the Ponca were often at the point of starvation. To make matters worse, white settlers had been slowly filtering into Ponca Territory and squatting on valuable bottom land fields. Bending to their inevitable situation, the Ponca chiefs signed a treaty with the U.S. Government on 12 March 1858 which ceded to the government all 2.3 million acres of land which the Ponca owned or claimed “except for a small portion on which to colonize or domesticate them.” In return, the Federal Government promised to “protect the tribe in the possession of the remainder of their domain as their permanent home and to secure them in their persons and property” (Royce, 1899, p. 818). In the spring of the following year, in 1859, the Ponca tried to make their customary tribal buffalo hunt, but encountered a combined party of Sicangu Lakota, Oglala Lakota and Cheyenne at the headwaters of the Elkhorn River. The combined party attacked the Ponca hunting camp, killing a Ponca sub-chief named Heavy Cloud and 14 others in retaliation for selling their lands to the U.S. Government the previous year (Howard, 1965, p. 31). By 1865, the last treaty signed with the Ponca, ceded an additional 30,000 acres of Ponca land to the U.S. Government, reducing the Ponca Reservation near Niobrara Nebraska, in what is now Knox and Boyd counties, to a mere 96,000 acres. It was the ft. Laramie treaty of 1868 that forever altered the course of Ponca history. Among other things, through an inexplicable and almost criminal blunder, the treaty established the boundaries of the “great Sioux (Lakota) Reservation” which included the 96,000 acres that was the Ponca Reservation. The Teton Lakota Bands now had a perfect excuse for their continued raids on the Ponca, as the Ponca were now trespassers in their own homeland. Over the next eight years, the Ponca repeatedly appealed to the U.S. Government for protection and assistance. However, the government made no effort to correct this fantastic error, or to protect the Ponca as promised in the treaty of 1858. When these cited figures above are added, the total comes to 600 persons accounted for. It is therefore safe to say that the population of the Ponca Tribe in 1874 consisted of a range between 600 and 769 individuals. In 1876, the U.S. Government formulated a policy to consolidate as many tribes as possible in the Indian Territory of Oklahoma. The Ponca Tribe was approached by a government agent from the Indian Bureau, who selected 8 chiefs to accompany him to Oklahoma to look over several alternative sites for a new Ponca Reservation there. The Ponca chiefs made the journey to Indian Territory in Oklahoma, visiting many different land reserves which were equally barren and unsuitable for agriculture. The Ponca chiefs refused to select any of the sites and after informing the government agent of their decision, requested to be allowed to return home to Niobrara, Nebraska. The agent, angry at their lack of cooperation, then left the Ponca chiefs, some of whom were advanced in years and ill. The chiefs were then forced to make the journey home in the middle of winter, without money, food or an interpreter. Some 50 days later, the Ponca chiefs reached the Otoe Reservation along the Kansas/Nebraska border. The Otoes provided them with enough food and horses to make their way back to Niobrara, Nebraska. The long march took a heavy toll on the tribe, over half of whom were women and children. Storms, along with poor road and traveling conditions, greatly impeded their journey, causing a lot of suffering and deaths. Chief Standing Bear's daughter Prairie Flower, and his wife Shines White, were among those who died along the way. It was not until 9 July 1877 that the party passed through Baxter Springs in Southeastern Kansas and crossed the line into the Indian Territory on the lands of the Quapaw Tribe. They were quartered in tipis they had brought with them, as no other provisions had been made by the government for their accommodation. Discouraged, homesick and hopeless, the Ponca now numbering 681, found themselves on the lands of strangers, in the middle of a hot summer, with no crops nor prospects for any (Howard, 1965, p. 35). The Ponca were very unhappy in this location and pleaded for a better location in the Indian Territory. Another location was found for them on the west bank of the Arkansas River, covering both sides of the Salt Fork River in North-Central Oklahoma near what is now Ponca City. This land was part of the Indian Territory purchased from the Cherokee by the U.S. Government in the treaty of 1866. In July of 1878, the Ponca were moved again to this new parcel of 101,894 acres, and it was set apart as the Ponca Reservation. The Ponca were suffering from malaria in this new country and many died from it. Food was also scarce as they had been on the move during the summers of 1877 and 1878 and had not been able to cultivate any crops. When Bear Shield, the eldest 12 year old son of Chief Standing Bear died in 1878, the Chief was unwilling to bury him in this strange country. Therefore, Standing Bear and sixty-six followers left the Ponca Reservation in January 1879 on foot, following a wagon containing the body of his dead son, as they headed north to the traditional Ponca burial grounds in Nebraska. Because the Ponca were not to leave their reservation without permission, Standing Bear and his small group of followers were labeled as a renegade band. Gen. George Crook was then given orders by Secretary of the Interior Carl Schurz to arrest the run-a-ways and return them to Indian Territory. By March 1879, Standing Bear and his followers had reached the Omaha Reservation in Nebraska, and the Omaha Chief Iron Eyes took pity on them, and offered food and asylum. However, Gen. Crook caught up with Standing Bear and his Ponca followers, took them into custody without incident, and began escorting them back to Indian Territory. On their way south, they camped at Ft. Omaha near the city of Omaha, Nebraska and their story was made known to the citizens there. The case of Standing Bear vs. Crook was brought before Judge Elmer S. Dundy in U.S. District Court on 30 April 1879, and by 12 May 1879 Judge Dundy had filed his now famous decision in favor of Chief Standing Bear holding that “an Indian is a person the same as a white man, and similarly entitled to the protection of the constitution.” Standing Bear and his followers were set free, and he then continued back to the Ponca tribal burial grounds on the Missouri bluffs where he buried his son with tribal honors. In the same report filed in 1880, it was recorded that among the Ponca in Oklahoma, 80 houses had been built. In addition, 350 head of cattle, and 600 horses were recorded, along with wagons that had been provided. Also, 350 acres had been planted with corn and other vegetables (Foreman, 1946, pp. 253-254). Although Standing Bear and his followers were freed in the spring of 1879, they had no home to return to in Nebraska. However, after the trial, President Rutherford B. Hayes assigned a commission to investigate details and found that the Ponca were being unjustly treated. By August of 1881, only 26,236 acres in Knox County, Nebraska were returned to the Ponca near Niobrara, and by 1882, there were 170 Ponca living there. From this time, the Ponca have been divided into the Northern Ponca of Nebraska and the Southern Ponca of Oklahoma (Howard, 1965, p. 38). Poverty and disease would continue to take its toll on the Ponca over the years, however their populations steadily increased. By 1906, just one year prior to Oklahoma statehood, the total Ponca population was 833, divided as 570 Southern Ponca in Oklahoma and 263 Northern Ponca in Nebraska. In 1936 the Oklahoma Indian Welfare Act paved the way for the Southern Ponca in Oklahoma to create a constitution and by-laws still in use today. This document titled, “Constitution and Bylaws of the Ponca Tribe of Indians of Oklahoma” was registered with the U.S. Department of the Interior, Bureau of Indian Affairs. Then, figures taken in 1937 showed a total population of Ponca was 1,222, divided as 825 Southern Ponca in Oklahoma and 397 Northern Ponca in Nebraska. By 1950 the U.S. Government formulated a policy which called for the dissolving and termination of all Indian Tribes. This policy effected some 109 tribes and bands including 13,263 Indian people and 1,365,801 acres of trust land. In 1962, the Congress of the United States decided that the Northern Ponca Tribe should be terminated. In 1966, the Northern Poncas were completely terminated and all of their land and tribal holdings were dissolved. This termination removed 442 Ponca from the tribal rolls, dispossessing them of 834 acres in Nebraska. During the 1970s members of the Northern Ponca Tribe, unwilling to accept their status as a terminated tribe, initiated the process of restoration to federal recognition. In April 1987, Nebraska passed legislative resolution #128 giving state recognition to the Northern Ponca Tribe and its members. The Ponca Restoration Bill giving the Northern Ponca federal recognition was introduced to the U.S. Senate, passed, and was signed into law by President Bush on 31 October 1990. The Northern Ponca now operates under a constitution consistent with the Indian Reorganization Act of 18 June 1934. As a result of the 2000 census, it was determined that there were 4,858 individuals in the United States that identified themselves as being Ponca alone, or Ponca in combination with another tribe or race. 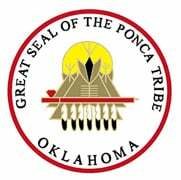 In 2018, The Ponca Tribe of Indians Oklahoma (Southern Poncas) has 3,783 enrolled members.